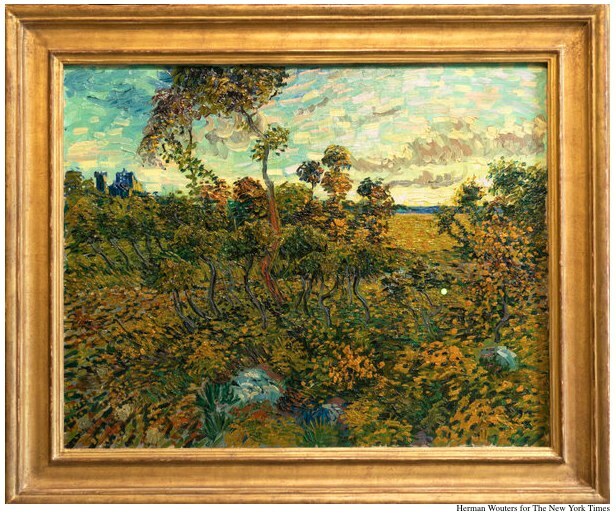 “Sunset at Montmajour” certainly looks like the work of Vincent Van Gogh, but when in the early 20th Century it was dismissed as a fake, its owner stuck it in the attic. There it sat for the next sixty years. Now it’s out, and after two years of learned study it’s acclaimed as the genuine article. From 1888 yet, Van Gogh’s prime period. Now, all of a sudden, we’re terribly interested. Although now that its authenticity is established, the merits of the piece don’t seem to engage us as much as the speculation around how many tens of millions the work would fetch if it were put on the market. not be confused with that of imitators and forgers. But here we have a painting that’s been just what it is since it was painted in 1888. If it was engaging enough for someone to acquire, you’d think it would be nice enough to hang somewhere better than the attic. Even if it maybe wasn’t a Van Gogh. Or was the name and its associated glitz the only reason it was bought in the first place. And the name, together with the market value, the only reason we bother to look at it now. Marketplace excitement is a common phenomenon. It’s merely ridiculous in the world of, for example, fashion accessories, where flash and display are the whole game, but actively destructive in the world of art. A painting is what it is, and has an inherent esthetic value, regardless of the money and status games that are played over and around it. It’s vital that even a second-rate Van Gogh, like this one, should be looked at for what it is: a particular landscape, a unique work of art, a thing to be considered and appreciated for itself, something apart from the displays of the foolish rich.